Hi, friends! Sending all sorts of Happy Friday thoughts your way. And if you’re about to launch into a long weekend for Labor Day in the U.S., then here are three cheers for you! 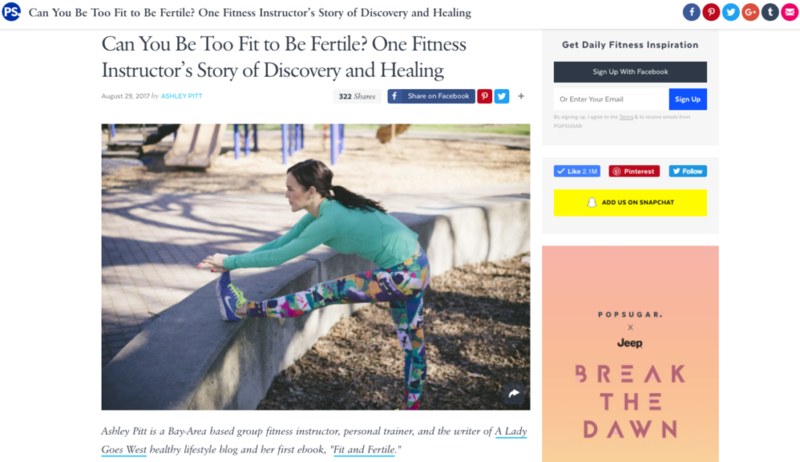 I was so excited a few weeks ago, when the POPSUGAR Fitness team reached out to me and asked if I would write an original piece sharing my story about healing my body and what I learned about the relationship between fitness and fertility, (all of which you can read about in detail in my ebook “Fit and Fertile“) for their site. I loved being able to get this piece out there to a wider audience, so that more and more people and women can know about this important topic in the fitness industry! In case you missed it, here’s the story: “Can You Be Too Fit to Be Fertile? 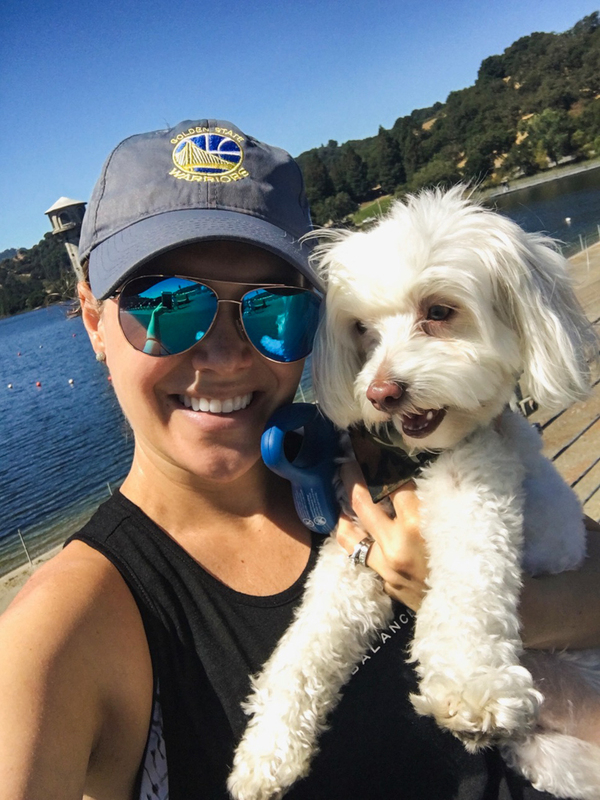 One Fitness Instructor’s Story of Healing and Discovery.” Thanks, POPSUGAR! Oh look she’s talking about ice cream again … eye roll. Yes, I’m a creature of habit and have taken on an insatiable craving for ice cream since getting through my first trimester of pregnancy. And for all of you special and patient readers who haven’t gotten too annoyed with me yet, the ice cream pictures and chatter continue today. But with this recommendation right here, well, it’s worth the mention, believe me. I love to try all the healthy new ice cream varieties, and eat them a lot, but I also like to eat the completely not healthy varieties of ice cream, because sometimes that’s the whole point of dessert. Every Sunday, Dave brings me home a new pint of Ben & Jerry’s, and it’s usually one of the same small rotation of flavors, like red velvet or strawberry cheesecake. Well this past Sunday, something new appeared. At first I was skeptical, because it didn’t sound as decadent as I normally would like. But it is now my new favorite pint of ice cream around, because the banana flavor mixed with caramel, graham cracker and fudge is beyond delicious. 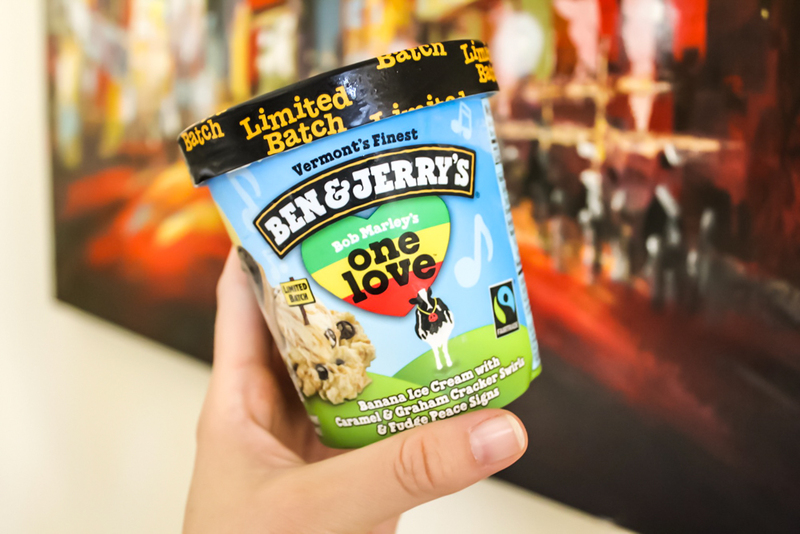 Bob Marley’s Limited Batch One Love is the name, which has a little ring to it, wouldn’t you agree? Do yourself a favor, ice cream lovers, and try this one out. It literally makes me smile. Is that bad? 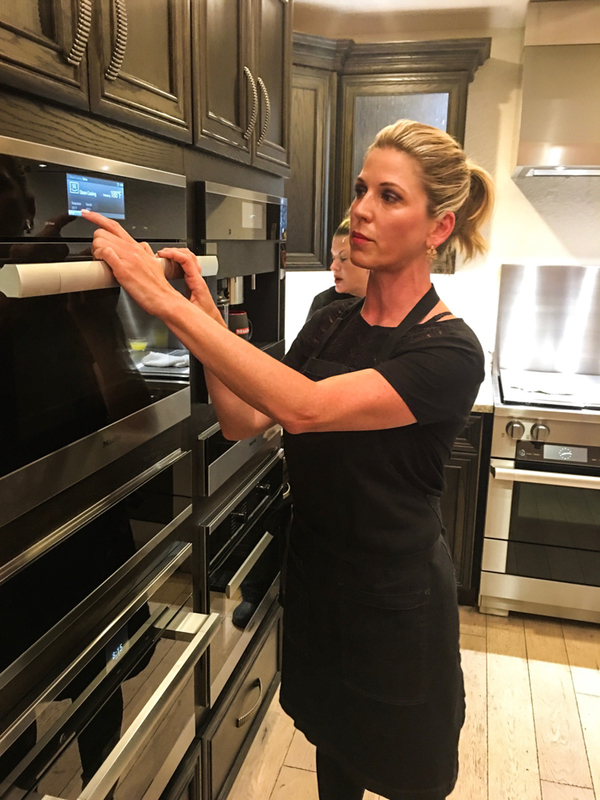 Okay, so you know you’re an adult when you start getting excited about appliances, but hear me out with this one: A few weeks ago, shortly after Dave and I got back from our babymoon to Santa Barbara, I attended an event hosted by Miele USA appliance brand at a local appliance center. Glamorous, right? But the thing is — it was. There was valet parking, a red carpet entrance, a step-and-repeat for pictures, fancy finger foods and even a cooking demo by popular Top Chef‘s Casey Thompson, who just happens to be based nearby in Napa. Recognize her? The event was being held to celebrate the opening of a new “Miele Innovation Center,” which is basically a store-within-a-store showcasing all of the high-end Miele appliances for potential buyers in Pleasant Hill (the next town over from me in Walnut Creek). I honestly didn’t even know how to pronounce Miele when I went to the event, but I learned a ton about the company while I was there and came away a fan. The head honchos from the company’s German headquarters were in attendance too, and they were all very tall and well dressed and gave some nice remarks to the crowd. And here’s the best part: The Miele people are so darn nice, that they let me pick out a vacuum cleaner as a thanks for coming to support the event. And in order to figure out which one would work for me, I used their online vacuum quiz to get the best match for my needs. How cool is that? 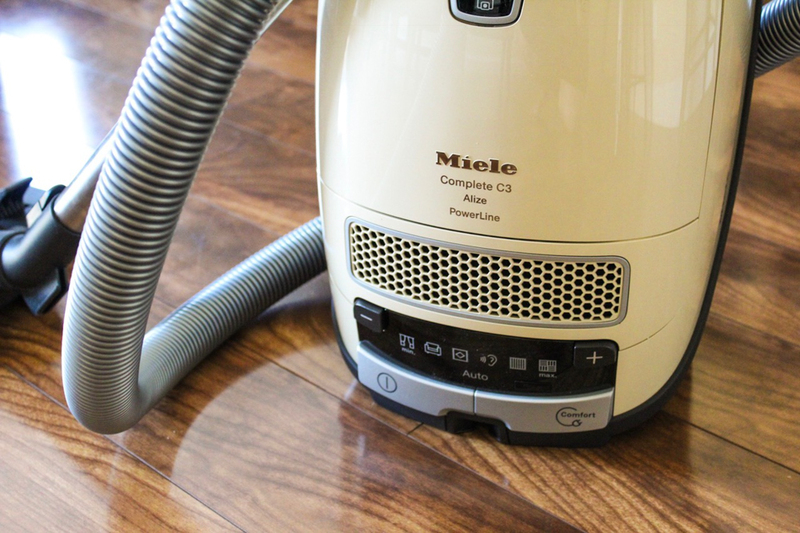 I took the test, and it showed that a canister was the one for me — the Miele Complete C3 Alize. And it just happens to be a shade of one of my favorite colors — cream! 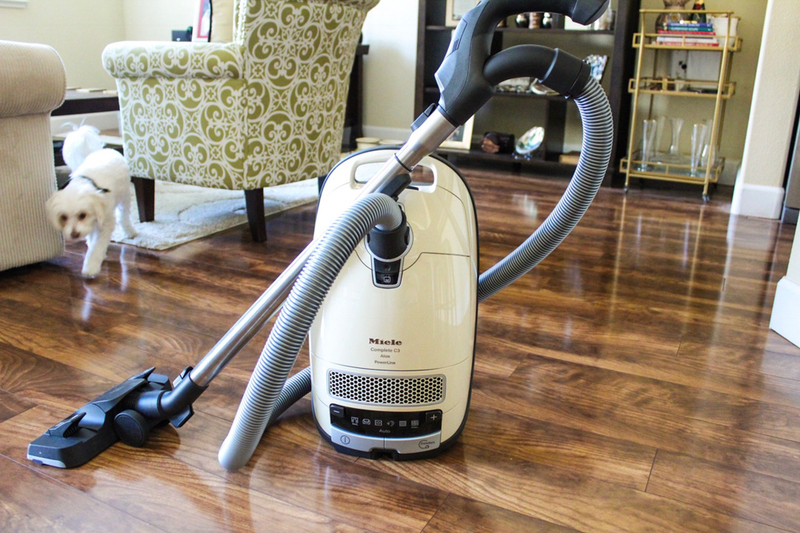 So I had never tried a canister vacuum before and had certainly never used anything as high-quality as this Miele deal. It’s so powerful, well-designed, light, quiet and basically useful for any type of space. Dave and I are BIG fans of our new toy — although I must admit there is a smaller and furrier member of our family who does not like the new addition at all. And I won’t call him out by name, for the sake of his privacy. Nonetheless, we’ve effortlessly vacuumed the stairs in our townhouse, our wood floors, and even the interior of our cars with this one contraption (and I’ve never owned a tool good enough to really clean out a car, and sometimes find myself at the gas station pay-per-minute vacuum just to get the job done). Sorry for being a dork, but this new vacuum makes me one seriously happy gal, particularly as I continue to tidy, organize, clean and nest as my pregnancy nears its end. Woohoo! Thanks to the Miele folks! BODY REALNESS: My blogging friend, Gina, opened up about some surgeries she recently had, including having her breast implants removed and getting her abs fixed after two pregnancies. Super honest post, which I loved to read. The comments are great too! WELLNESS: This is interesting for all you lovers of anti-inflammatory pills out there. That medicine could be messing up your muscle growth. FITNESS: Don’t forget about your back, people. I was happy to provide a little bit of input for this article on exercises to improve your rear view. FOOD: Who isn’t excited about Whole Foods dropping their prices? Here’s a side-by-side comparison of a few products showing how Whole Foods stacks up against Trader Joe’s now. Also, congrats to Courtney and Patricia, who won copies of “Blogger to Author” from last week’s giveaway in this post. And if you’re planning to check out the Labor Day deals this weekend, looks like Gap is offering 50 percent off (best place to buy maternity activewear, if you ask me! ), and Macy’s is offering free shipping and 15 percent off too! Shop away! What are you up to this weekend? Do you have an extra day off? What’s something honest and open you’ve read recently? Share the link! What’s one thing that’s making you happy this week? Ok, I’m officially going to Publix today to pick up the One Love pint. I’ve been hesitant because of the banana base, but you’ve sold me. Hi Court! Yes! I really hope you like it! And if you don’t, I mean … it’s ice cream, so you’ll still SORTA like it hahah! Happy Friday, gal! Enjoy your long weekend! Hi Carrie! You’ve heard right. Walnut Creek is insane. I love it here, but I mean, how do we have temperatures 30 degrees higher than you when we are so darn close? Take me back to the City hahahaha! Happy Friday, gal! I bet you are up to something fun this weekend. ENJOY! OK I think I NEED to try that One Love ice cream! It sounds amazing. I also sing praises about Miele vaccums. My mom always had one growing up – she received hers for her wedding and it worked well for 30+ years! She ended up getting one of the canister vaccuums for me for my wedding shower last year and I love the thing. It’s so quiet and powerful and definitely built to last. I do have a long weekend and I’m headed to NY state for a wedding! Have a good one! Hi Traci! So cool! The vacuum lasted 30 years? That’s pretty amazing! My last vacuum was NOT nice, and so I can totally tell the difference now that I have a nice one. Glad you are a fan too. Hope you have SOOO much fun at the wedding! Labor Day weddings are popular for sure. Happy Friday, lady! WOOHOO! Congratulations on Fit and Fertile being #1 on Pop Sugar! One thing that’s making me really happy lately is just realizing that God is working everything for good in my life, and I don’t need to worry. Hi Emily! You are so darn positive, lady! That is a GIFT! Hold onto it! I LOVE IT! And keep spreading all of your joy. Thank you for being here and saying hi and always making me smile. Happy Friday! Congrats on the PopSugar feature! Super cool. I LOVE Casey Wilson. I would totally tackle hug her and force her to cook me things. Hi Susie! She was super cool in person and very fit looking too, if I may say hehehe. I wish I could cook like her — although then Dave wouldn’t do all of our cooking, and that wouldn’t be fun hahaha! Happy Friday, lady! Congrats on being featured on Popsugar! That’s so awesome. And I wish I could send you some of our cooler temperatures we’ve been having lately. Usually August here is HOT and humid, but it’s been in the low 70’s all week, so weird. Tom’s first football game is tonight, so my life will revolve around football this weekend, lol. Happy Friday Ashley! Hi Sarah! Happy Friday! hahahah! I know! Sunday dessert surprises are my favorite! Screenshot that to share with your man ahhaha! Hope you have a fab long weekend, lady! Woah does that ice cream flavor sound dreamy!! This weekend I have a long run with the team Saturday morning and then I’m hoping to sleeeeeep on Sunday because we just had a full week of 5:45 am practices and I’m so ready to not wake up before the sunrises haha. Monday is my last day of summer break and my team is having a pool party after practice so that should be fun 🙂 ! Even though I may feel blah when I first wake up, seeing the sunrise and having the whole day open after our extra-early practices has been nice. I also really enjoyed taking my calculus studying to a local cafe! Such a nice change of environment. Congrats on the PopSugar feature! That ice cream flavor sounds awesome, I will have to keep an eye out for it. Hope you have a great weekend and are able to stay cool. Hi Emily! Thanks, lady! You deserve some delicious ice cream this weekend for sure. Hope you find it! Happy Friday, friend! Love it – I joke that Ben & Jerry are my boyfriends because we are that serious. Hi Abby! hahah! I love that! Ben & Jerry are GOOD men! 🙂 Happy Friday, lady! We have friends coming into town from Philly, so we are hoping to log a few more hours on our boat before it’s time to put her away for winter. Ice cream just might have to happen, too!